(Gzira, Malta)- Malta has often been described as the ‘crossroads of the Mediterranean’. The fleet gathering for the 50th Anniversary Rolex Middle Sea Race may well help change that description to the ‘crossroads of the world’, certainly the sailing world. Some 55 yachts, representing 25 countries from as far afield as Australia, Canada, Chile, The Philippines, and the United States, have entered to date. There is nothing unusual in this spread of nations. The race, which this year starts on 20th October, has always attracted a polyglot fleet and a walk along the dock is a cultural affair. Nicholas Ibañez Scott, skipper of the Chilean entry ANITA, a J/122E, is returning to the race for a second time having made his debut in the tough conditions of 2017. ANITA was one of only 35 yachts out of 104 starters to complete the 606nm last year. 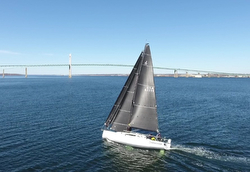 Testament to high quality and construction of the J/122E and the tough streak running through a crew used to the southern straits of Patagonia. One of the elements that struck Scott the most about their first encounter with the race was a sense of belonging. “We feel very much at home here,” he said before the start, putting this down to the warmth and professionalism of the Royal Malta Yacht Club along with the attitude and quality of the competing sailors. Countries represented in the 2018 Rolex Middle Sea Race so far include: Australia, Austria, Bulgaria, Canada, Chile, Czech Republic, Denmark, France, Germany, Greece, Italy, Malta, Netherlands, Philippines, Poland, Romania, Russia, Slovakia, Slovenia, Spain, Sweden, Switzerland, Ukraine, United Kingdom and the United States. Amongst the fleet of nine J/Teams, eight countries are represented! In the IRC Class 4/ ORC 4 Division, three teams are sailing, including the J/133 BLUE JAY III sailed by Matt Stokes from Canada, the J/121 JACKHAMMER sailed by Andrew Hall from the United Kingdom, and the J/133 JIVARO sailed by Yves Grosjean and his French team (note- this boat has been an RORC Offshore Season winners and also Fastnet Race class winner). In the past, the IRC 5/ ORC 5 division has twice been won by J/122s that have also won the Rolex Middle Sea Race as Overall Champions. This year’s group includes the J/122 JOLOU sailed by Sergey Senchenko from Russia (double-handed winners in 2017), the J/122 JOY sailed by Cascino Giuseppe from Italy, the J/122 OTRA VEZ sailed by Sean Arrigo from Malta, and the J/112E ANITA sailing with a Chilean team led by Nicolas Ibanez Scott. Then, in the IRC 6 Class, there are two J/109s vying for class honors; 2HARD is also sailing in IRC Doublehanded class with Martin Hartl from Austria on the helm and JARHEAD YOUNG SAILORS MALTA is a group of youth sailors from the local hosts- the Royal Maltese YC. 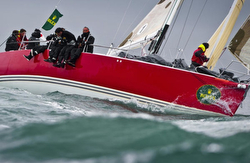 For more Rolex Middle Sea Race sailing information Add to Flipboard Magazine.